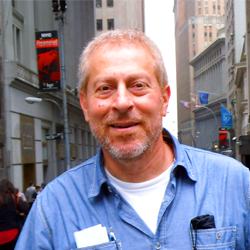 Last Fall, Best Buy unveiled a robotic selling machine in a store in Manhattan’s Chelsea district. Nicknamed Chloe, the device retrieves items such as DVDs and personal electronics from a racked assortment of 15,000 items and delivers them to shoppers in about 30 seconds – even after the store is closed. The whole process takes place behind a glass wall and it’s controlled by 9 touch-screens. It was developed over several years by the same team of Best Buy techies who brought us 200 Best Buy Express vending machines that lurk in airports, in collaboration with PaR Systems, a Minnesota industrial engineering firm. Perhaps best of all – unlike many human clerks, Chloe can afford to live in the neighborhood where she works. 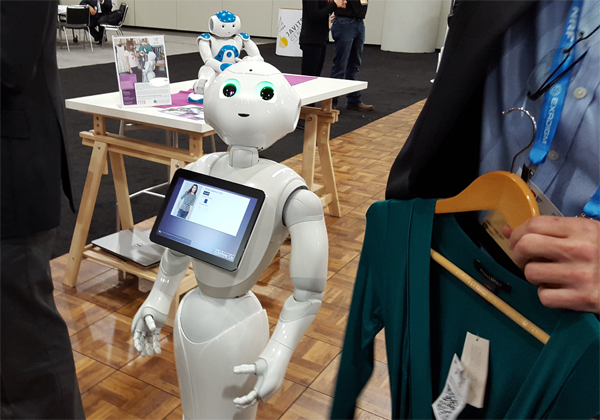 Retail robots that greet shoppers and lead them to their desired purchases. 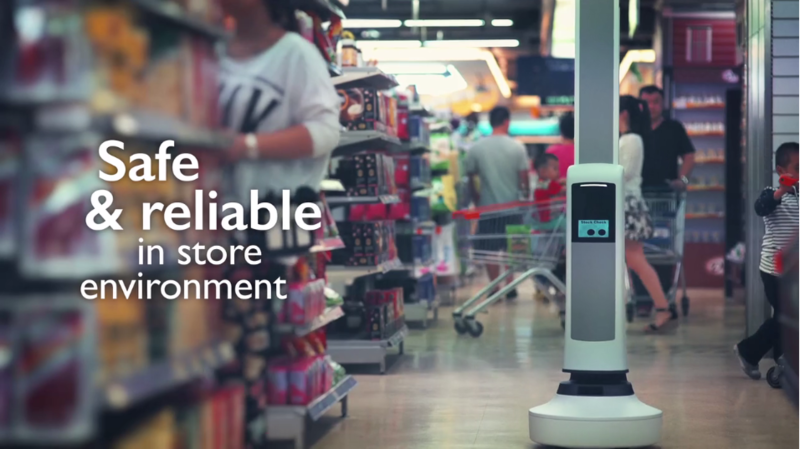 Retail robots that roam store aisles to scan and report inventory problems. 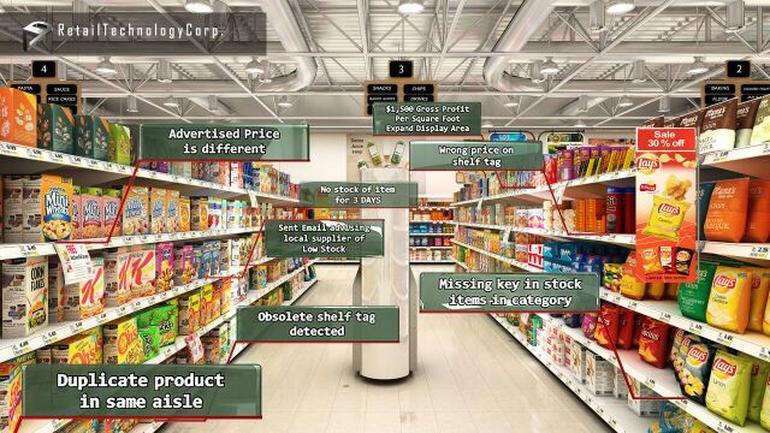 Retail robots that map and measure the store environment to enable more accurate category planning. Warehouse robots that deliver picked items from the rack to the packing desk. 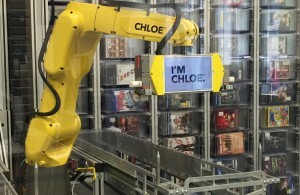 Warehouse robots that seek, “see” and pick individual items from the rack. December 2014 was a robotic milestone for the Orchard Supply, the upscale division of Lowes Hardware. The video here depicts its OSHbot robot greeter “employed” at an Orchard Supply store in San Jose, CA. The prototype communicates in English and Spanish. It can “see” using machine vision and retrieve items from the store shelves. The device was commissioned from Fellow Robots by the Lowes innovation lab. Sales and services robots stalking store aisles or hotel hallways may sound like some kind of sci-fi dystopian future trope, but their use in distribution centers is almost an old idea, since Amazon.com purchased robotics innovator Kiva Systems in 2012. By Cyber Monday 2014, it had 15,000 semi-autonomous robots deployed in its DCs around the country, moving product rapidly from racks to the shipping dock. 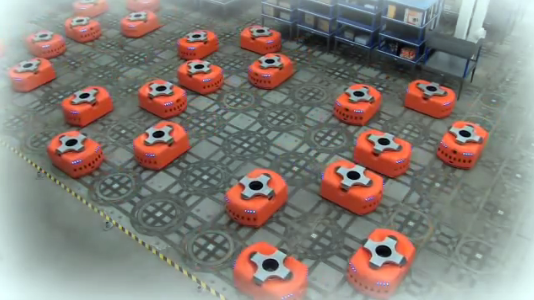 Kiva robots are also at work in facilities operated by Walgreen and Staples. Take a look – the choreography is rather impressive. It’s all about the efficient movement and distribution of goods. 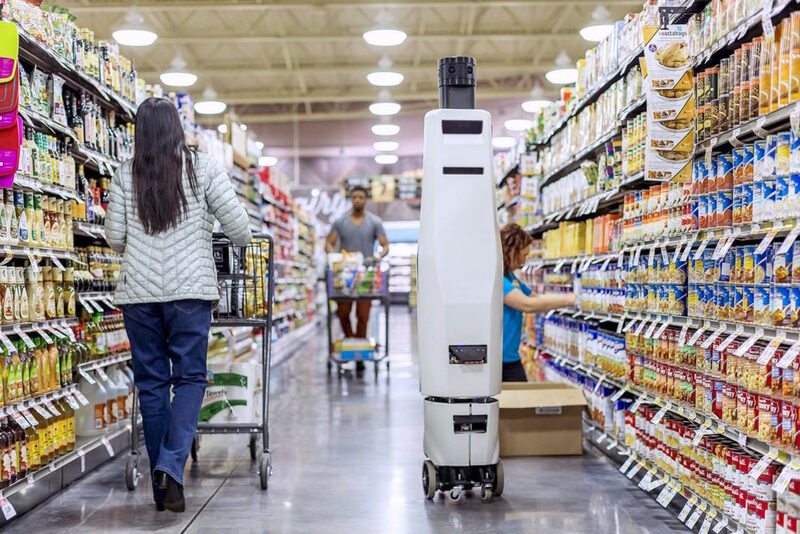 Tally has several interesting rivals, notably RF Spot, Los Altos, CA, an in-store sensing robot designed to rove the aisles, capture store conditions and maintain accurate location maps. 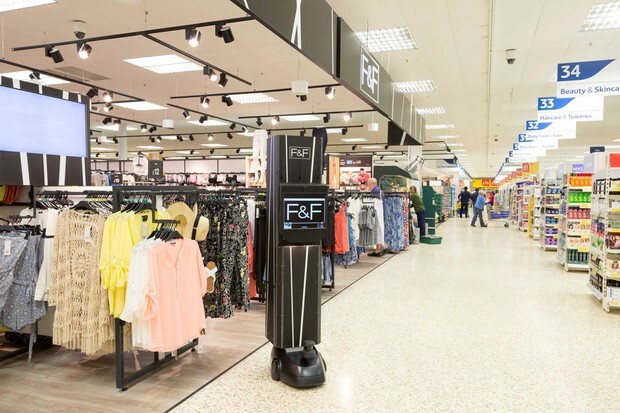 The image below, depicts one of five installations in Tesco stores in the UK, where the are being used to track and maintain its F&F apparel line, according to RFID Journal. I had an opportunity to view a Retail One “top secret” concept video, which showed a 1 meter tall device navigating around shoppers in a supermarket environment while its on-board cameras captured image after image of shelf conditions. The concept appears to have great promise for OOS detection, at least, although I was worried at times that it passed to close to some shoppers who may not see them coming. It’s still a prototype, they reminded me. Certainly there are great differences between the controlled environment of the warehouse, with its emphasis on moving material rapidly, and the unpredictable store environment, with its multiple moving shoppers. The prospect of continuous human-versus-machine interaction on the retail floor could be a source of some concern, I think. The prospect of various automated devices maneuvering along the aisles and among shoppers is no doubt a source of dread for liability insurers (and for some of us with elderly parents). Many of these robotic solutions in some measure combine sensing, mobility, connectivity and analytics. Their potential to deliver a higher order of in-store sensing for store operations seems quite good, although the ROI seems uncertain, at least at the beginning. May I interest you in a top to go with those slacks? The robots intended for customer service purposes take the concept to another plane. The range of shopper experience so far is pretty broad – ranging from talking kiosks on wheels to artificial beings that are so realistic-looking that it makes me uneasy. The jury is still about about what is the right degree of anthropomorphism needed for “face-to-diode” interaction. There’s little doubt, however, that a robot clerk can have perfect and complete recall about products on hand. It seems the momentum is already building behind in-store robotics. It may be foolish to try to stand in their way. 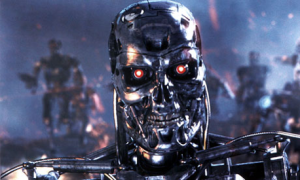 Are robots the key to omnichannel inventory management?